NASA will soon visit Hawaii’s Lo’ihi volcano, which sits more than 3,000 feet beneath the Pacific Ocean, all in the name of one day hunting for life out in the solar system. Lo’ihi is an active volcano sitting about 50 miles off the coast of the Big Island. The space agency is specifically interested in Saturn’s moon Enceladus and Jupiter’s moon Europa — both of which are suspected to harbor heat-emitting vents and oceans beneath their thick, ice shells. 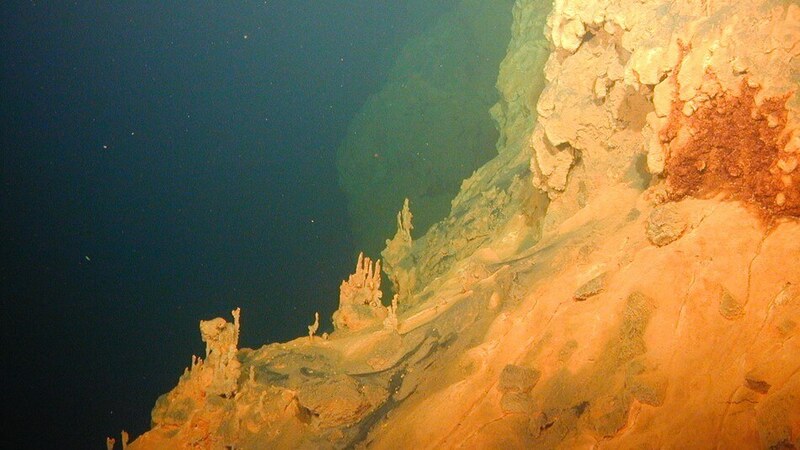 Deep sea vents are common below Earth’s oceans, existing thousands of feet down in parts of the Atlantic and Pacific. There, the scorching vents are famous for emitting thick plumes of “black smoke,” which feed extremophile microbes and worm-like creatures nearby. In some locations lobsters, snails, and crabs also rely on these vents. “But Lo’ihi is different,” Darlene Lim, a NASA geobiologist and head of the SUBSEA program, said in an interview. Scientists suspect that if deep sea vents exist on other worlds, they’re more like Lo’ihi’s, which aren’t quite as intensely hot as black smokers in the deep Atlantic, said Lim. A closer view of the microbial life on Lo’ihi. NASA doesn’t have an exploration vessel, but the National Oceanic and Atmospheric Administration (NOAA) does, so NASA is partnering with the seafaring agency to study Lo’ihi for 21 days. Remote operated vehicles (ROVs) will be sent down to Lo’ihi to collect rocks and observe the vibrant microbial community around the volcano. “It’s extremely rich in diversity,” Craig Moyer, a volcano microbiologist at Western Washington University who has been studying Lo’ihi for over two decades, said in an interview. Life down around Lo’ihi isn’t just abundant in microbial chemotrophs — which feed exclusively on chemicals in a lightless world — but these communities change in parallel with Lo’ihi’s fluctuating activity, said Moyer. Since Lo’ihi’s eruption in 1996, the volcano has been pretty quiet and the vents have cooled off, meaning the volcano isn’t emitting much of its typical gases like hydrogen and hydrogen sulfide. This leaves the microbes down there to feed on the chemical available, iron. But when Lo’ihi’s activity ramps up again, heat and new chemicals will allow other microbes to prosper. vigorously erupting Kilauea is likely to share a deep plumbing system with Lo’ihi.” data-reactid=”96″ style=”user-select: auto !important; margin: 0px 0px 1em;”>”My fingers are crossed that we’ll see an uptick in the activity once again,” said Moyer, noting Hawaii’s vigorously erupting Kilauea is likely to share a deep plumbing system with Lo’ihi. The icy, cracked surface of Jupiter’s moon Europa. 45,000 Olympic-sized swimming pools — nearby Lo’ihi is relatively easy for NASA to study because it’s in U.S. territory. ” data-reactid=”109″ style=”user-select: auto !important; margin: 0px 0px 1em;”>Not only is Kilauea exceptionally active right now — erupting enough lava over the last month to fill over 45,000 Olympic-sized swimming pools — nearby Lo’ihi is relatively easy for NASA to study because it’s in U.S. territory. “It’s a wonderful confluence,” said Lim. By the end of SUBSEA, which plans to visit another volcanic vent system in 2019, Lim hopes to give NASA’s future deep space planners an improved idea of where to best seek life on uncharted alien worlds like the moon Enceladus. “Anywhere you’ve got liquid water you’ve got a high probability of finding life,” said Moyer.